Product categories of Welded Pipe Machine, we are specialized manufacturers from China, High Frequency Welding Tube Mill, Welded Pipe Mill suppliers/factory, wholesale high-quality products of Tube Welded Machine R & D and manufacturing, we have the perfect after-sales service and technical support. Look forward to your cooperation! Supply Ability: 30 sets per month. 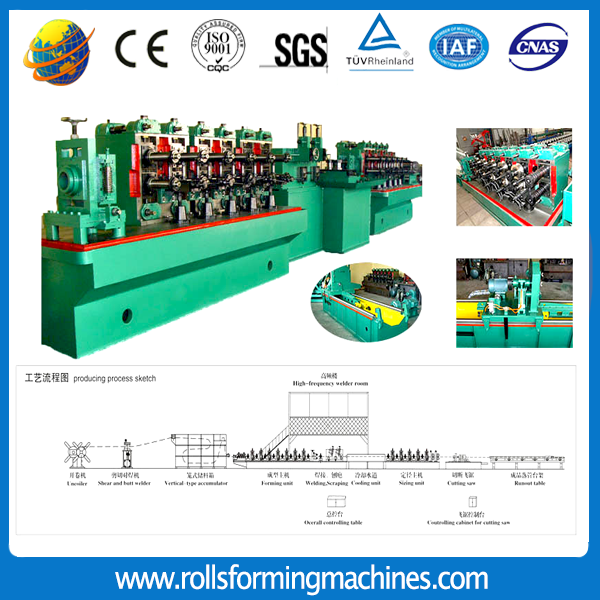 Welded Tube Mill is called cold Roll Forming Machine for welded pipe. Checking from the name, we can know that it is a kind of pipe making production line. For this machine, it supports the material thickness from 0.5-5mm, for diameter range from 10-127mm. And now there are four types welded pipe machines: HG32, HG50, HG76 and HG127. For different material thickness, diameter range, choose different pipe machine.Except them,we also supply Down Pipe Bender.